By CNN'S ROSA FLORES AND RYAN NOBLES CONTRIBUTED TO THIS REPORT. Florida Gov. Rick Scott at a press conference on July 10, 2017. (CNN) - Broward and Palm Beach counties in Florida are once again at the center of a brewing controversy over vote counting as two of the highest-profile races in the state appear to be headed toward a recount. In a news conference on Thursday night, Florida Gov. Rick Scott -- who is also the Republican candidate for US Senate in the state -- alleged without providing evidence that there could be rampant fraud in both counties and accused Democrats of trying to "steal" the election. Scott's campaign and the National Republican Senatorial Committee filed two lawsuits on Thursday, one against the Broward County supervisor of elections, Brenda Snipes, and the other against the supervisor of elections in Palm Beach County, Susan Bucher. The lawsuits allege that the supervisors have not been transparent either about the collection of the vote or about the vote count, in violation of Florida law. Snipes told CNN she was not aware of Scott's announcement of a lawsuit and was not commenting. In his news conference, Scott accused the election supervisors of "mysteriously" finding votes and called for a full "law enforcement" investigation, promising to take any legal action necessary. "Tonight I am asking the Florida Department of Law Enforcement to investigate this immediately, and I am considering every single legal option available," Scott said. "We've all seen the incompetence and irregularities in vote tabulations in Broward and Palm Beach for years. Well, here we go again," Scott said. "I will not sit idly by while unethical liberals try to steal this election from the great people of Florida." 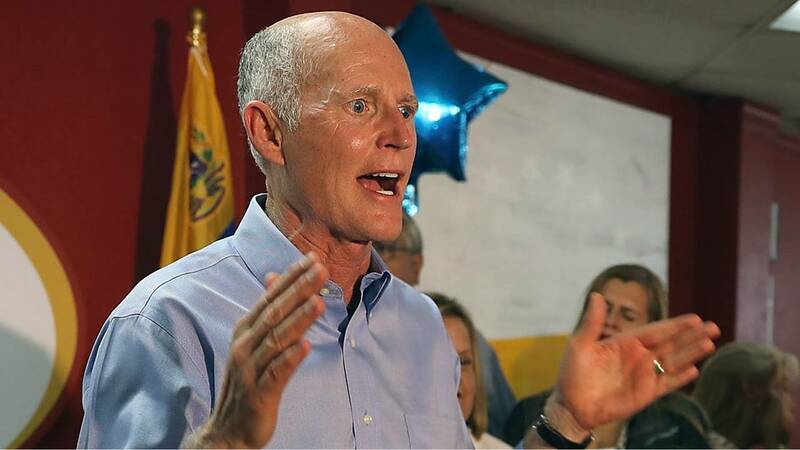 The campaign for Democratic Sen. Bill Nelson, Scott's opponent, said the governor's actions appeared to be "politically motivated." "The goal here is to see that all the votes in Florida are counted and counted accurately," said Nelson spokesman Dan McLaughlin. "Rick Scott's action appears to be politically motivated and born out of desperation." Democratic gubernatorial candidate Andrew Gillum tweeted in response to Scott that "counting votes isn't partisan — it's democracy. Count every vote." President Donald Trump later weighed in, tweeting, "Law Enforcement is looking into another big corruption scandal having to do with Election Fraud in #Broward and Palm Beach. Florida voted for Rick Scott!" Scott delivered his blistering statement at the governor's mansion in Florida. His role as chief executive will surely raise conflict-of-interest concerns. He did not take questions at the news conference. His news conference comes amid questions over discrepancies in the vote tallies in Broward County. A CNN analysis of votes cast in Broward County suggests that ballot design could be responsible for a substantial difference in the number of votes cast between the race for governor and the race for senator in Florida, meaning thousands of voters there may have missed their chance to weigh in on the still-undecided Senate race. The placement of the Senate race on the ballot could have made it possible to overlook. Broward and Palm Beach counties became infamous for vote-counting problems during the 2000 presidential recount. Fueling the controversy on Thursday, a teacher said she found a box marked "provisional ballots" in a storage area of the school long after the voting had taken place there Tuesday. Lakeisha Sorey, a resource teacher at Sunshine Elementary School who has taught in Broward County schools for 16 years, said it looked like a plastic storage bin with a hole on the top with a printed label that said "provisional ballots" taped on the box. In a telephone interview with CNN on Thursday night, she said she took a picture but did not try to open or lift the box, because she did not want any questions. "I did not touch it," she said. "I knew that the elections were a federal thing, so I didn't want any of those issues. I didn't want there to be any interference." Dozel Spencer, the Broward County Elections Voter Equipment Center director, told CNN that this was equipment, not ballots. He said it takes several days to pick up equipment after Election Day. Broward is a Democratic-leaning county. Among those who did vote in the Senate race there, 69.1% backed Nelson, while 30.9% backed Scott. Gubernatorial candidate Gillum topped Republican former Rep. Ron DeSantis in the county by a similar share of the vote (68% for Gillum to 31.3% for DeSantis), but he earned about 10,000 more votes from the county. Nelson trails Scott in the Senate race by about 15,000 votes statewide, and the race is likely heading for an automatic recount because the margin is so narrow. Overall, as of Thursday, nearly 25,000 voters in the county had cast ballots for governor but skipped voting in the Senate race, according to a CNN analysis of precinct-level results. Photos shared on Twitter of the ballot used in Broward show the races for Senate and the county's congressional districts in the lower left corner of the paper ballot, below lengthy instructions on how to vote. The candidates for governor were listed more prominently to the right of the instructions. In neighboring Miami-Dade, where a sample ballot posted online suggests the Senate race appeared at the top, there were more votes cast for Senate than there were for governor. Across all 67 counties in the state, Broward's is the largest difference in votes cast between the two races, by more than 23,000 votes. Across the 547 precincts in the county where both the Senate race and a congressional race were on the ballot, a comparison of the total votes cast in the governor's race and the Senate and congressional races shows a nearly identical dropoff for the two federal races in 127 of them, meaning that nearly all voters in those precincts who skipped the Senate race also skipped the congressional race. That suggests those voters may not have seen the two races in the bottom left corner of the ballot. Across all precincts with both Senate and congressional races in the county, roughly 3% of people skipped voting in the Senate race even though they had voted for governor. In the part of the state represented by Democratic Rep. Frederica Wilson, who ran unopposed, it is likely that no House race appeared on the ballot, as Florida law does not require votes to be counted in unopposed contests. That would leave the Senate race on its own in the bottom left corner of the page. In precincts that are part of that congressional district, the dropoff rate was even higher, with roughly 10% of people who voted in the governor's race not voting for Senate. Sorey, the teacher who found the box labeled "provisional ballots," said Broward County needed to improve its handling of ballots. "We need to get it together, especially in Broward County," Sorey said of the elections system. After finding the box at the elementary school, Sorey contacted her friend, Democratic state Rep. Shevrin Jones, who attended the Harvard Kennedy School's Senior Executives in State & Local Government program with Sorey's husband. Jones called the Broward Elections Department. When he told the elections official about the box labeled provisional ballots, he said the official on the phone told him the box merely contained "ballot paper." Jones said he did not understand how the elections official would know what the contents of the box were, or why the box appeared to be locked, without having someone physically check it. "I don't know how they would be able to determine that there was nothing in the box just from pictures they had seen or just from me having a conversation with them," Jones said in a telephone interview Thursday night. Jones said that no one from the Broward County election called him back to tell him whether the box had been checked or picked up. "It could still be in the storage area," Jones said. "It's so baffling. It's so bad." "There has to be a better way in how we are administrating when it comes to the election process, especially now," Jones said. "We are 48 hours after the election and we are in a total cluster mess-up. It's unfortunate that we are in this situation again -- Broward County is the laughingstock of the country." Correction: This story has been updated to correctly reflect that the two highest-profile races in the state appear to be headed toward a recount, not a runoff as originally stated.